Rajamangala University of Technology Suvarnabhumi (RMUTSB), one of the significant centers of education for science and technology in the central region of Thailand, was renamed as a government university on 18th January, 2005 and supervised by Commission on Higher Education, Ministry of Education. The university comprises four campuses covering three provinces. Huntra and Wasukri campuses are situated in Ayutthaya province whereas the other two campuses are in Nonthaburi and Suphanburi Provinces. Despite its recent foundation, the university has long been developed and has undergone several organizational changes, for its eminent achievement in professional education for over 30 years. Three of the four campuses were originally the vocational education colleges by the name of Ayutthaya Agricultural College, Ayutthaya Commercial Colleges and Nonthaburi Technical College under the supervision of Department of Vocational Education (DVE). Later in 1977, according to the Education act, the DVE’s 28 colleges were transferred to Institutes of Technology and Vocational Education (ITVE) including these three colleges. The Ministry of Education had changed the name of its educational institutes and reorganized them to form 28 campuses of the ITVE which was equivalent to a department of the Educational Ministry. Ayutthaya Agricultural Campus had been consequently under the ITVE’s administration ever since. 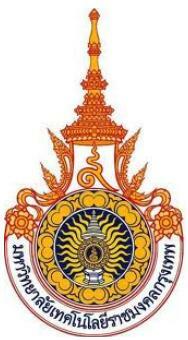 In 1988 the name “Rajamangala Institute of Technology” (RIT) was awarded to the ITVE by King Bhumibol Adulyadej. In 1989 the Ministry of Education renamed RIT’s 17 provincial campuses resulting in the new names of these 3 campuses as “Phranakhon Si Ayutthaya Huntra campus, Phranakhon Si Ayutthaya Wasukri campus and Nonthaburi campus”, respectively. Later in 1995 the five new RIT’s campuses were established as the following; Chiengrai campus in the north, Sakonnakorn campus in the northeast, Sriwichai campus in the south, Saraya and Suphanburi campuses in the central of Thailand. In doing so, the fourth RMUTSB’s campus thus originated in Suphanburi province. After the promulgation of the first national Education Act in 1999 onwards, all institutes of higher education have been under the supervision of Commission on Higher Education. Therefore, the RIT reformed the RIT Act 1975 by assembling all RIT campuses and restructuring them into 9 groups before proposing the RMUT Act to establish nine universities in which the RMUTSB was launched by reuniting Wasukri, Huntra, Nonthaburi and Suphanburi campuses and housing the office of the President based in the Huntra district. Rajamangala University of Technology Suvarnabhumi invoked the presence of the Royal Seal of His Majesty King Bhumibol Adulyadej, the ninth monarch of the Royal House of Chakri, for the University Official Seal. It is placed under the Great Crown of Victory, and encircled by eight yellow lotus petals which symbolize wisdom, generalization, and joyfulness. Below the seal, “Rajamangala University of Technology Suvarnabhumi” is written in blue inscription on white sash trimmed with red. RMUTSB envisions itself as a leading university of science and technology for community, society and international. Researching and conducting innovations in correspond with social needs. Providing academic services of science and technology for community and society development. Preserving and maintaining Thai art and culture, and conserving the environment. Applying modern management and utilizing good governance. Faculty of Agriculture and Agro-Industry. Faculty of Administration and Information Technology.